When I was in my early teens, one particular family trip to the ocean stood out in my mind. This particular day was interesting because we stopped at the warning board that we may have passed by many times on previous trips but for some reason this time my dad stopped to read it. Now, to be perfectly honest, I ignored it. A bunch of us were out swimming and I noticed that we were getting farther and farther away from the shore. We were farther out than I ever remembered being before. It did seem like we were too far out but I didn’t panic because my dad didn’t panic. To this day, I’m not sure if he was ever worried about it. He had us swim parallel to the shore for a bit which seemed odd but I trusted him. We ended up on the beach a ways away from where the rest of the family was camped out and we had to make the long walk back to our beach chairs. The reason why he didn’t panic was because he learned before we got into the water what to do in that situation. The warning board talked about what to do if you get caught in a rip current which is what happened to us. If he didn’t read it, we could have possibly keep trying to swim against the current but we would have just drifted farther and farther from the shore. Since he knew what to do, it was no big deal and I didn’t think too much of it. Afterwords he fully explained what happened. What I’ve learned from this is that you need to be prepared for what could go wrong just as much as prepare for what can go right. Life doesn’t always go the way we plan and so we need to be prepared for what to do when things eventually go wrong. And if you are in a position of leadership in an organization, your team will trust you if you are prepared to lead when things are going as planned and when things seem to be falling apart. If you plan well, very few people will even notice that it didn’t go as well as you had hoped. 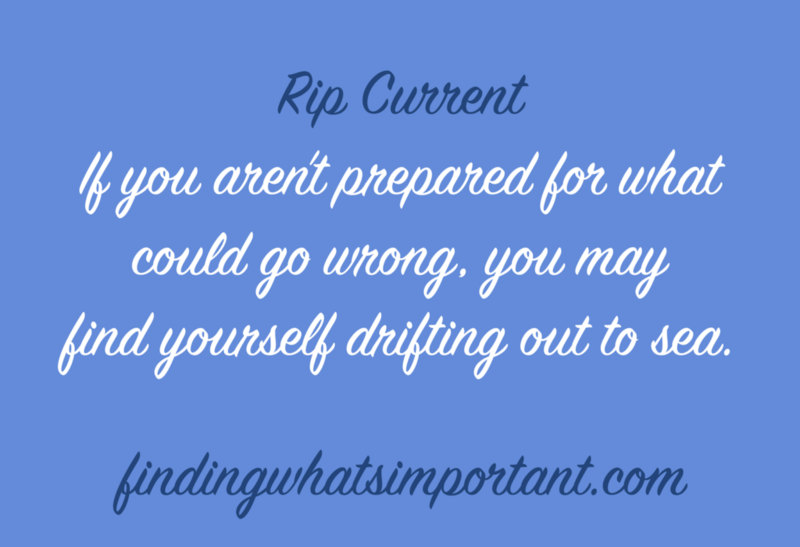 Know what to do so you don’t continue to drift out to sea.